The Hawk Eye Wireless Spy Camera. 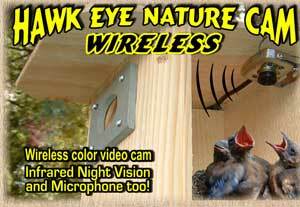 Witness a Bird Box Nest Wirelessly! The Hawk Eye Wireless is the perfect solution for our customers who simply can't get the audio-video (AV) cable on our wired Hawk Eye Nature Cam into the house. The camera has infrared night vision, built-in microphone, a 70-degree, wideangle, variable focus lens, and sun hood. But please note there is no such thing as a totally wireless camera. All cameras still need electrical power and so some type of power cable must be run to it. Once plugged in and operating, it will transmit the audio and video signals wirelessly to a receiver, which in turn passes the signals to the television or AV compatible computer.